A je tady ... další facelift druhé generace Mondea - Mark V.
The Ford Mondeo is adopting a fresh new look, making this already attractive vehicle even more appealing. A number of detailed exterior changes strengthen the timeless and contemporary design of a car which remains a strong favourite in the competitive European CD segment. The new look complements Mondeo's acclaimed driving quality, and extensive range of derivatives. With its impressive line-up of TDCi diesel engines, including the exciting 155 PS, 400 Nm, 2.2-litre version, its exciting ST performance derivatives, and its practical, yet premium wagon, the Mondeo range offers something for every customer. All Mondeos benefit from Ford's Intelligent Protection System (IPS) which continues to make Mondeo one of the safest vehicles on the road. With so much included in the Mondeo range, it is no wonder that Mondeo is one of only two vehicles in the European CD segment to achieve double-digit market share in 2004. 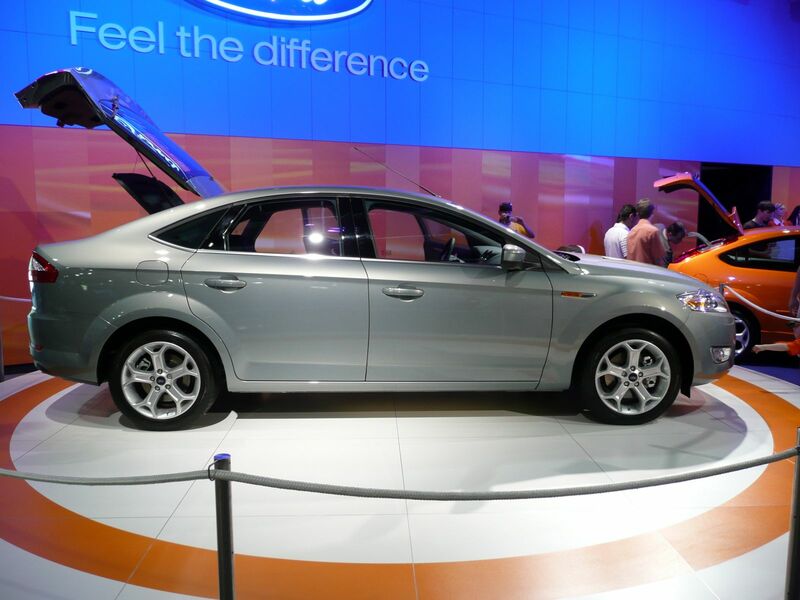 Coupled with the physical changes to the Mondeo is a modification of the series line-up to maximize customer choice. This includes the incorporation of the Titanium and Titanium X models as regular series alongside the Ghia and Ghia X models because of continued customer demand. The Titanium X was originally introduced in 2004 as a "limited production" model. "We believe these latest changes to Mondeo, coupled with the inclusion of some of the most modern technology such as Bluetooth™ will allow Ford's European flagship model to lead the field in providing choice, driver satisfaction, and overall value," said Kevin O'Neill, Ford of Europe's Executive Director for Large and Luxury Vehicles. "The great success Mondeo has enjoyed to date proves we have a winner, but we won't stay ahead by standing still." The new Mondeo looks sportier and more luxurious, yet remains a contemporary, classic design. Signalling the changes outside are restyled front and rear bumpers with new lower valances, plus more detailed chrome applications around the vehicle. "When looking at the current Mondeo we saw an already stylish vehicle, yet we knew from customers and from our own perspective that detailed changes could make it more contemporary," said Chris Bird, Ford's European Director of Design. "It wasn't any one thing that we identified, but several subtle nuances that we could make adjustments to in order to enhance the visual appeal." Such adjustments to the four-door and five-door models include the addition of chrome accents and more clear glass to the large rear lamps, giving them a fresh, elegant appearance. In addition, the new-look rear bumper lower valance now incorporates distinctive and functional red reflectors on four- and five-door models. All Mondeo models get new look upper and lower grilles at the front. The Ghia and Titanium series each get a bodycolour full-depth lower bumper which will also be common on the X derivatives. The Ghia X and Titanium X models also get a lower stainless steel bar and bodycolour bumper protection mouldings. As a finishing touch, all models now receive clear 'jeweled' side repeaters on the front fenders. Inside, the Mondeo retains its premium quality feel and high level of specification, but some subtle changes have been made. Chic new trim fabrics and different bezel colour options (silver, Ghia look and electro-plated titanium finish) are on offer across the range. Also, the central clock has been subtly changed with a new black appliqué, plus changes in hand colour and lighting have been made to improve visibility for the driver. Upscale models, like the Ghia and ST, offer a higher chrome content in keeping with the interior's contemporary feel. Along with exterior and interior changes across the Mondeo range, improvements have been made to enhance driving quality. "We really wanted to improve the driver interface with the vehicle, but in a way that improved the driving experience and made vehicle operation safer as well as more convenient," said O'Neill. With these objectives in mind, key changes to the new Mondeo include improved brake feel, giving the driver more responsive, solid feedback when applying the brakes. The changes improve Mondeo's already excellent brake performance. On Mondeos equipped with Ford's Durashift 6-speed manual transmission, a gear lever trigger has been added which helps to eliminate potential mis-shifts. A spring-loaded ring under the gear knob now has to be lifted by the driver when selecting reverse gear. "Our customers told us they wanted even more precision in the Durashift 6-speed transmission, so we have added this trigger to meet that demand," added O'Neill. For today's driving conditions, the Ford Mondeo leads in providing affordable convenience and connectivity features. For mobile telephone users, three hands-free kits are available, two of which feature the latest Bluetooth™ technology. The basic level offers a hands-free phone kit with a phone cradle base plate in the console. It also has phone book access and an external antenna but no voice control. There is no Bluetooth™ access. Moving up, customers can choose from either a single Bluetooth™ or a Bluetooth™ with Cradle system. With the single Bluetooth™ system, any Bluetooth™ telephone can interface with the hands-free system inside the car. Bluetooth™ technology allows customers to establish a wireless connection between their telephones and the in-car system. The system can be programmed to recognise up to 5 different mobile phones, so any of these can automatically re-establish contact each time the vehicle is accessed. The system can also be programmed to prioritise any particular telephone, as only one device can establish the wireless connection at any time. A Voice Control function allows the driver or passenger whose telephone is connected to the system to make or accept calls with vocal instructions. Of equal importance is the fact that this system also provides Voice Control of other key vehicle features such as the audio system and the climate control system. Moving up to the Bluetooth™ with Cradle system, a telephone holder is fitted in the centre console to enable phone charging and connection to an external antenna for better reception. Also, the customer's mobile telephone address book can be accessed through the In Car Entertainment (ICE) unit display. Both Mondeo Bluetooth™ systems include a Digital Sound Processor, or DSP, for optimum speech quality. In addition, both systems allow for safe control of telephone functions via the radio and an integrated microphone. All three hands-free systems not only offer a technology advantage but are also priced lower than much of the upscale competition. Another benefit is that they are available on all levels from the entry level tape or CD player to the High Navigation system. The Voice Control system can also store up to 20 phone numbers, 20 radio pre-sets and 20 navigations system settings. "Bluetooth™ and the Voice Control system are perfect examples of Ford's ability to combine industry-leading technology with great value," said Wolfgang Balduin, Supervisor, Application Infotainment Sub-Systems. "Not only we are able to provide cutting-edge communication technology in the segment but we have also been able to offer it at a better price than some of the more expensive competition." Users of the latest personal audio devices such as I-Pod or MP-3 players will appreciate Mondeo's In Car Entertainment (ICE) systems, all of which include an "Auxiliary Input" socket located in the glove box. The standard 3.5mm audio jack socket allows Mondeo owners to bridge portable technology with their ICE system by using a readily available cable connection. By plugging in their I-Pod, MP-3 player or even a portable tape or CD player, customers can enjoy their audio material through the Mondeo's impressive sound system, and use the ICE system to control volume, sound quality and balance/fade. The new Mondeo range offers more choice and better value than ever. It is designed to appeal to the widest possible range of customers, whether they are looking for value, luxury or performance. At the top of the Mondeo range, with the emphasis on performance, is the Mondeo ST. While the Mondeo ST220 with its 226 PS 3.0-litre Duratec V6 engine is already a favourite of performance motorists, the Mondeo ST formula is now being made available to Diesel customers, with the introduction of the Mondeo ST TDCi across Europe. Equipped with the 2.2-litre Duratorq TDCi engine, this Mondeo ST generates 155 PS at 3,500 rpm. Maximum torque is 360 Nm at 1,800 rpm with a peak at 400 Nm in overboost, giving Mondeo one of the most powerful diesel engines in the segment. "Combining the availability of the 3.0-litre Duratec V6 with this high performance Duratorq diesel, we really think we have covered all customer needs in offering sporty performance," O'Neill commented. Originally introduced in Autumn 2004 as a "limited production" series, and now becoming a permanent addition to the Mondeo range, the Titanium model offers a sophisticated, techno alternative to the traditional upscale Mondeo Ghia. "We believe the Titanium models offer a very appealing blend of contemporary materials and sporty design," said O'Neill. "They are also great value for money, so we believe this combination will attract new customers to the Ford brand." Several exciting features make Mondeo Titanium a formidable alternative in the competitive marketplace. While detailed cosmetic changes have been made to improve Mondeo's contemporary style, the Mondeo range retains its impressive line-up of powertrain options. An extensive range of Duratec petrol, Duratorq TDCi and Duratorq TDDi diesel engines are available, providing customers with unparalleled choice, whether they favour performance or economy, or both. At the top of the range is the exciting, high performance 2.2-litre TDCi coupled with a 6-speed manual gearbox, which delivers an impressive 155 PS and up to 400 Nm of torque. The combined fuel consumption is 6.1lt/100km (city 8.2 lt/100km, urban 4.9 lt/100km) and the combined CO2 emissions 161 g/km. [NOTE: figures for the wagon are 6.3, 8.4, 5.1 lt/100km and 166 g/km respectively]. Furthermore, this engine will be modified to meet the Euro Stage IV emissions level by August 2005. The 2.0-litre 115 PS and 130 PS TDCi engines offer a wide range of choice, coupled with 5- or 6-speed manual or automatic 5-tronic Durashift transmissions. The torque figures for these two engines are 280 Nm at 1,900 rpm and 330 Nm at 1,800 rpm respectively, with an additional power reserve due to the overboost function. In manual transmission format, both of these engines already comply with the Euro Stage IV emissions level. For great economy and value, the Mondeo 2.0-litre TDDi offers 90 PS with 245 Nm of torque at 1900 rpm. The combined fuel consumption is 5.8 lt/100km (city 8.1 lt/100km, urban 4.5 lt/100km) and the combined CO2 emissions 154 g/km [NOTE: figures for the wagon are 6.0, 8.3, 4.7 lt/100km and 158 g/km respectively]. It should be noted that by August 2005 this engine will be replaced by another 90 PS high pressure common rail version that will also achieve Euro Stage IV emissions. Additionally, Mondeo can be specified with either a 2.0-litre, 145 PS Duratec engine with a choice of Ford's Durashift 5-speed manual or 4-speed automatic gearbox or one of three 1.8-litre Duratec engines: the 110 or 125 PS ones which are coupled to a 5-speed Durashift transmission or the direct injection 130 PS Duratec SCi engine which comes with a 6-speed Durashift manual gearbox. Good looks, exceptional powertrains, modern technology and features - all of these would mean little if Mondeo's driving dynamics were not top of the class too. Mondeo has been praised for its exceptional driving performance since its launch in 1993. But what Ford's Driving Quality engineers strived for and achieved with the latest generation Mondeo, is an ideal balance between comfort and control at a high level. This was achieved by developing a suspension that offers good isolation from the road and offers the driver a confident feel from a vehicle that reacts to driver input as expected. A state-of-the-art chassis system helps Mondeo meet differing driver and road surface demands across Europe. With European continent drivers putting the emphasis on high-speed stability, a world-class suspension, both front and rear, is a must. In Britain, on the other hand, roads are tight and curving, also demanding an uncompromising and highly controllable architecture. "We are very proud at Ford of our ability to achieve what we consider excellent vehicle dynamics that equal or surpass the best in the segment," Kevin O'Neill commented. "It is a challenge to achieve just the right equilibrium in the areas of steering input, road feel and comfort. Judging from reactions of both our customers as well as automotive experts, we have met that challenge by attaining the right symmetry to offer exceptional vehicle driving dynamics." "Our approach to the safety system of the Mondeo was uncompromising," said O'Neill. "We are committed to keeping the new Mondeo at the forefront of safety."